Coming from Athens, take the exit 17 (Kantza), turn right and again right up the suburban station bridge. Pass the churches of Agia Triada and Palaiopanagia on the left and go straight on Papaggelaki road. Pass the first houses, go left (there is a house and a big tree right on the turn). Pass a small bridge and go straight towards Spaton Avenue and turn right. "Kellari Papachristou" is on the right side of the avenue, surrounded by a stone-built fence. Coming from the airport, take the exit 17 and turn right at Papaggelaki road. Go straight. Pass the first houses, go left (there is a house and a big tree right on the turn). Pass a small bridge and go straight towards Spaton Avenue and turn right. "Kellari Papachristou" is on the right side of the avenue, surrounded by a stone-built fence. Coming from Athens center, take the exit 18 (Peania-Spata) and turn left to Spata. Go straight until reaching a small roundabout, where turn left on Athinon-Spaton Avenue. Heading to Athens, meet supermarket "My Market" on the right and keep going straight. "Kellari Papachristou" is after 2,5km, on the left side of the avenue and is surrounded by a stone-built fence. During the above direction there are "Kellari Papachristou" signs to follow. 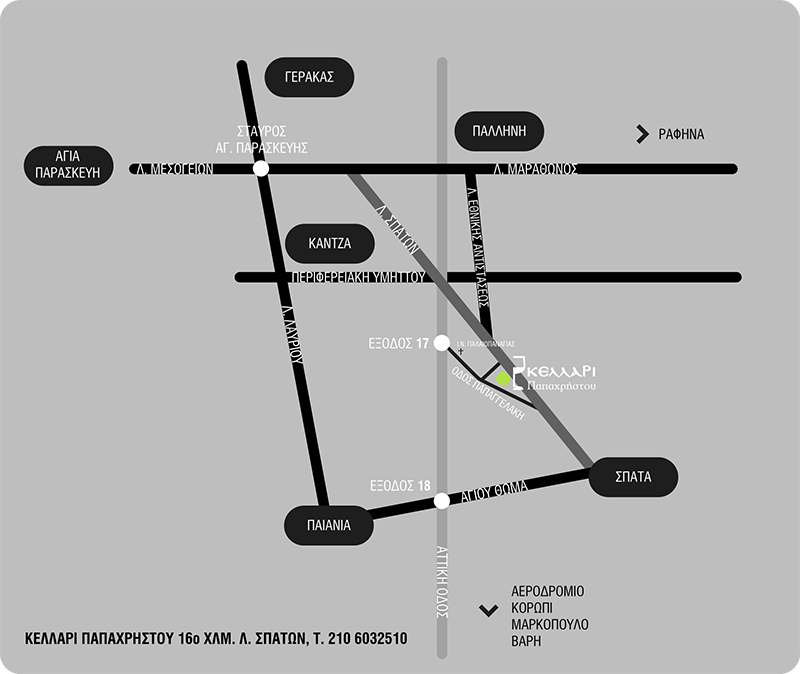 Coming from Eleftherios Venizelos Athens Airport, take exit 18 and turn right to Spata. Follow the above direction. Coming from Athens center, pass the Stavros interchange and turn right on the first traffic lights towards Spata/Artemis. "Kellari Papachristou" is after 4,5km, on the right side of the road. During the above direction there are "Kellari Papachristou" signs to follow. Coming from Glufada/Vari, pass Koropi town and head towards Peania town. Turn right at "Galaxias" supermarket, following Spata/Attiki Odos signs. Cross Attiki Odos (highway) heading to Spata on Agiou Thoma street. Keep straight until reaching a small roundabout, where turn left on Athinon-Spaton Avenue. Heading to Athens, meet supermarket "My Market" on the right and keep going straight. "Kellari Papachristou" is after 2,5km, on the left side of the avenue and is surrounded by a stone-built fence. During the above direction there are "Kellari Papachristou" signs to follow.